Hydrangeas are one of the most popular perennial garden shrubs, mostly due to their mesmerising big flowers in pink, white or blue color and nice foliage, even in autumn. They add a vintage charm to any garden. But they are not only beautiful, but if you follow our Step-by-Step Hydrangea Care & Maintenance Guide you’ll find that they are also very easy to care for. What makes them fascinating is the ability to change the color of the flowers. Hydrangeas are easy to care, easy to grow, hardy and resistant to most pests and diseases, with so many varieties to choose from, Hydrangeas are a must-have in every garden. You can also grow them in containers. Their flowers make stunning floral arrangements, used both fresh and dried. If you’d like to have these pretty ladies in your garden all you need to do is to follow our General Hydrangea Care & Maintenance Guide and learn how to plant them, grow them and take proper care for them. First thing you need to do before planting Hydrangeas in your garden is to choose the right varieties. There are two main groups: plants that bloom on new growth and plants that bloom on old growth. The first group of Hydrangeas form their buds in early summer on new growth and are pretty easy to care of. 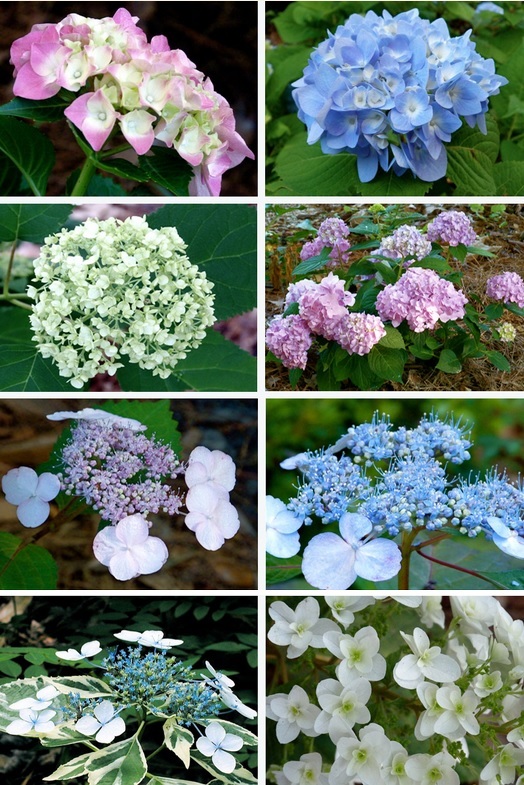 Panicle and Smooth Hydrangeas are most popular varieties from this group. The second group, or plants that bloom on old growth, are Hydrangeas that you should consider if you line in Zone 8 or warmer. Oakleaf, Bigleaf and Climbing Hydrangeas are some of the best varieties from this group. Green pine needles or brown needles that have fallen to ground? Lisa, I am having the same problems, i will be trying the pine needles. However i see your post was from a year ago. Did you have any luck this year Lisa? My sons girlfriend bought 2 hydrangeas and all the leaves fell off. I think they had too much sun. She brought them to me and I repotted them. The stems are not dry and brittle. I am hoping to save them. My only problem is that there is a fungus on the branches that are brittle. what can I do to save these plants? Just a thought, but you might spray them with a combination of water and white vinegar. Thank you for all the suggestions. I am trying hydrangeas for the first time this year, so I will be sure and follow these tips! I have a huge plant…healthy beautiful leaves but no flowers for two years. (It bloomed it’s first couple of years.) This Spring I applied bloodmeal to the soil and it is now covered in blooms! They won’t flower if they get afternoon sun and heat. Ive 5 that get afternoon sun and are in full bloom every year, maybe 8 years!!!! My hydrangeas get afternoon sun and I have tons of Blooms!! mine bllom but they dont grow….I have them in front of a black fence and wonder if that is hurting it?….but so hot in the summer and it does get mid morning sun…..
Will my hydrangeas grow on the north side of my house? Absolutely. Just make sure they don’t get too much afternoon sun. I recently planted my hydrangeas but the leaves have wilted and looks really bad. There is a lot of sand. They get plenty of sun and I water daily. I lost all the blooms. What can I do to save them? Mid summer my Hydrangeas develop black spots on the leaves that spread throughout the entire plant. This is a place I have had these plants for years. The spots initially looked like mildew like spots from a wet week but proved not to be the source and the problem returned last year. What can I do to prevent it this year? This year will be the 1st year I’ve ever planted hydrangeas. Does it matter in particular what time of day they get partial shade? B.c the front of my house is mostly Sun up until 5pm. While the back of my house is mostly shade in the afternoon. I plant my hydrangeas on either the north or east side of our farmhouse. I use homemade fertilizer once a month during the growing and blooming seasons. On days during the summer when it gets very hot (90° and up) they get watered both in the morning and in the evening. What a stunning Malinois. I have two of the breed. At what point, if any should you “dead head” the old blooms? This is my first attempt at growing the beauties? I’ve had two hydrangeas, one pink, one blue, planted on either side of a walkway for 4 years. They didn’t bloom the first year, maybe 3 blooms the next, then last year they were SO leggy and no blooms at all. This past fall I got the landscapers to mulch and asked them to “shape up” the hydrangeas…to my horror they pruned them to the ground! I thought they were done for! Well they came back beautifully! The bushes are huge, compact, perfectly symmetrical and the blooms are AMAZING! They have been blooming for weeks, the colors are vibrant and so plentiful. Their “error” was exactly what they needed! Oh yes! I had the same problem and my husband thought he’d take it upon himself to prune them like your landscapers. That seemed to do the trick and now the hydrangeas are absolutely stunning. The Deer are eating mine. What can I do? So we should prune in the fall? We moved in to our house in June 2012 ans our plants had so many beautiful flowers. The next spring we cut them back and we have never had a bloom since. We did learn to not cut them back and havnt since but we still arnt getting any blooms. You should get plenty of blooms the following spring after the one with little to none. Depending on the variety, you shouldn’t cut them back. However, if you want to then you will usually have none to very few blooms the following year. The next year the plants should produce a good amount of blooms and be fuller looking. I read cutting them back once in a while can rejuvenate the plant in regards to amount of blooms and fullness but it isn’t recommended to cut back (trim) most varieties. I have Annabelle hydrangeas(aka Incrediball Hydrangea) in my yard for years. They produce large whites blooms. They bloom on new wood so I cut them back every year in late winter/very early spring. They bloom every year without fail. My landscaper planted limelight hydrangeas in the front of house last September (2017). The blooms were brown, but eventually, I cut them off. My landscaper advised that I add some mulch and water them in the Spring. Well, I took her advise, and it’s now at the end of June and the stems and leaves are a “healthy green”; but the flowers have not bloomed. Is tnis normal, and if not, what should I do to get them to bloom? It is usually sunny in the morning, and there is shade in the afternoon. Suzanne Two years ago I cut my Hydrangea plant way down in the fall with the hopes of getting more blooms. No luck. The following spring & summer I only had 4 Blooms. Last fall I did not cut my Hydrangea plant at all. This spring, I put mulch around my plant as well as working coffee grounds into the soil. I have watered and fertilized. I now have the most beautiful Hydrangea loaded with with countless blooms !!! It is on the South East side of my house . My don’t do nothing won’t grow or Bloom and I buy so many. Can I put my Annabelle in a pot rather then in my garden as we are thinking of moving? What size pot. It’s only been in the garden since Father’s Day this year 2018. Do I move it in November? When do you prune hydrangeas? And how far down do you prune?